"The Sanger house is a fine cream brick building which stands two stories plus attic. The design is quite eclectic and richly decorated with massing and roof treatment recalling Victorian Gothic designs. (See [David J.] Hemlock house 234 Carroll St., WK 39/32). The buildiig is basically a rectangular mass with tower and truncated wings projecting to the east and west. A hip roof covers the main mass of the building; steep gable roofs with flared eaves project on the facade and east elevation. A side wing, with chamfered corners, is defined as a tower above the eave line on the west elevation. A rectangular stair tower, which was/ once similarly roofed adjoins the main gable on the facade. Both segjrientally arched windows and plain rectangular units appear on the building. Stone caps are applied above the arched units. A frame porch composed of massive turned posts and a variety of chiselled and sawn ornament completes the composition. "The interior of the Sanger house repeats the motifs introduced on the porch, which suggest derivation from East lake designs. The original room configuration has been maintained, as have fireplaces and woodwork. Window and door surrounds are fluted and feature corner blocks and pediments filled with incised details. One of the most impressive areas of the interior is the stair hall, complete with carved newel, turned balusters, wainscoting and stained glass windows. The second floor bedrooms are less elaborately decorated, but also retain original woodwork." Adapted from the Intensive Survey Form dated 2/10/82, submitted to the National Park Service for inclusion on the NRHP. 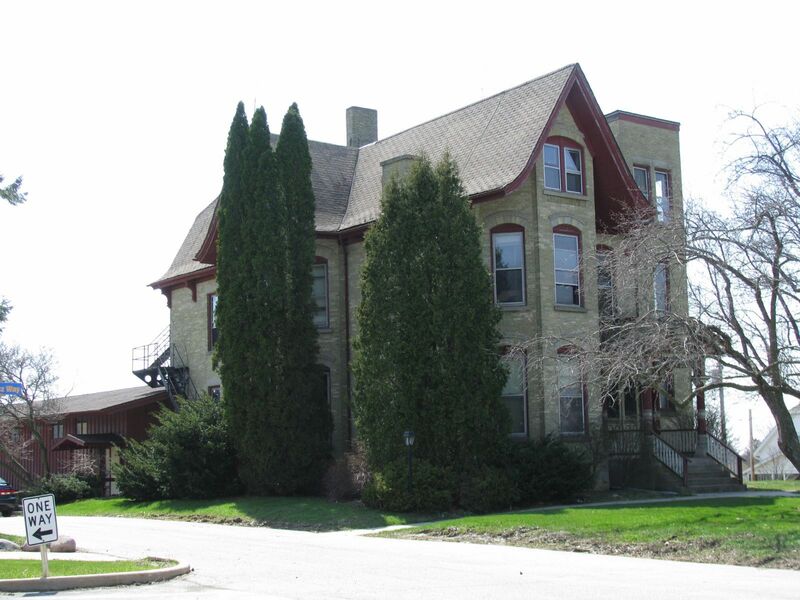 "Historical statement: The Casper M. Sanger residence is significant for its association with its second owner, Dr. Byron M. Caples and its use as the Waukesha Springs Sanitarium. The period of significance is from 1893-1941, the years Dr. Caples operated the sanitarium. "The Sanger house was built in 1886 by Casper Sanger, a wealthy tanner, farmer and Milwaukee Co. sheriff, as his county gentleman farm. He named the estate the Hickory Park Stock Farm. In 1893 Sanger had financial problems and deeded the farm to the Sanger Land Company which subdivided some of it and in 1898 leased the house and several surrounding acres to Dr. Byron M. Caples, who established the Waukesha Springs Sanitarium for the treatment of nervous disorders. In 1903, Caples opened a much larger building for the sanitorium but continued to use the Sanger house for "special cases". Caples finally purchased the house in 1912. (A/B) Dr. Caples was considered a talented psychologist and neurologist and served as President of the State Medical Society in 1910. He was a graduate of the Rush Medical College of Chicago and had served as assistant director of the Milwaukee Sanitarium in Wauwatosa. (B) Caples attracted patients from around the State. "The sanitarium was successful. However, he closed the institution in 1941 on his retirement. In 1944 the sanitarium was sold to Carroll College as a men's dorm and the house to St. Joseph's parish. The sanitarium was demolished in 1958. The property is now covered with 1970 's townhouses. The Sanger house became a convent in the 1940 's. Rather than remodeling the interior as the convent expanded, a low one story, with basement wing was constructed to the rear of the house. This area, and the second floor of the original house continue to serve as living quarters; the parlor, living room and dining rooms are on occasion used for conferences." Dr. Caples would go on to subdivide more of the farm, which became the Caples' Park Subdivision, now a historic district.